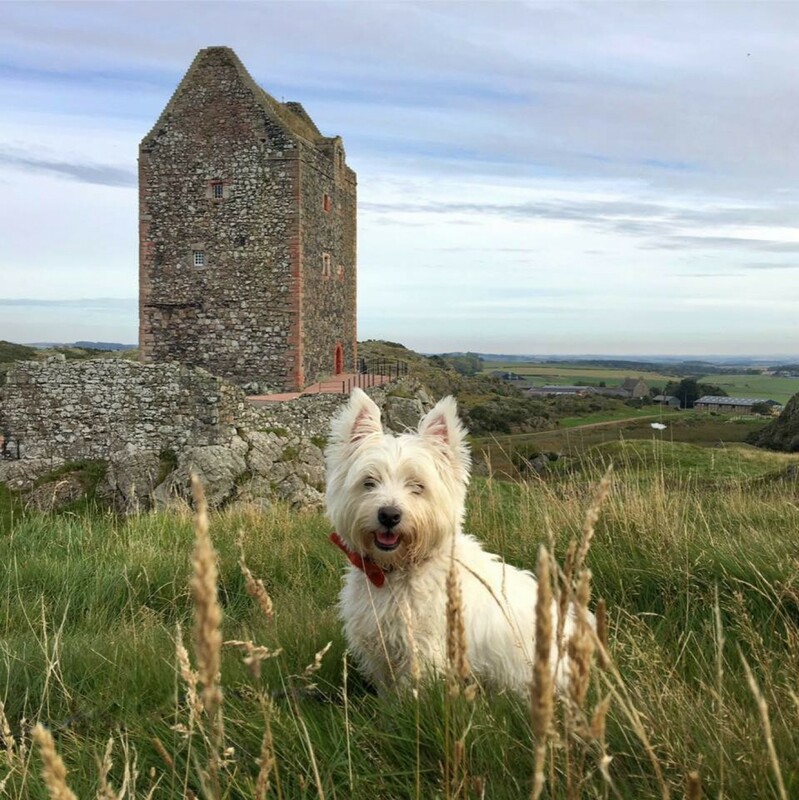 Today I’m delving into the Wee White Dug’s Scottish travel archives to share a taste of the stunning Outer Hebrides with you. In the Spring of 2015 we travelled to Skye to catch the ferry from Uig – we were bound for the Isle of Harris. Our accommodation for the trip was a self-catering cottage in Tarbert, Harris’s main village. It was the perfect base for our island adventure. Mr G is a stranger to a frying pan, but he absolutely relishes his roles as ‘washer wummin’ in our household. He was therefore delighted to find our wee cottage had laundry facilities and a drying green. Who knew there was so much conversation to be had in the discussion of clothes poles, pegs and a good drying wind! During our stay we ate our evening meals in the bar at the Hotel Hebrides which was conveniently located just outside our cottage. The food was great, but best of all were their gorgeous Harris Tweed dining chairs. I coveted them like Gollum covets a certain gold ring. Having stocked up on tasty breakfast treats from Tarbert’s village store we kicked-off each morning with a cooked breakfast. The legendary, Stornoway Black-pudding and freshly laid local eggs became a breakfast staple. The aim of our trip was to explore Harris & Lewis and tick off a couple of places from our bucket list. Luskentyre Beach on Harris and the Calanais stones on Lewis. Luskentyre Beach had long been on my bucket list and was one of the main attractions that drew me to the Outer Hebrides. It was everything I dreamed of and more – heaven on Earth. A little corner of paradise in Scotland. It took my breath away. Before breakfast each morning we headed there with the Wee White Dug. It was blissful – the entire beach was ours. The colours have to be seen to be believed. I’ll remember those wonderful morning walks for the rest of my days. As we travelled around Harris and Lewis we discovered one stunning beach after another. The wee dug was in his element and enjoyed trying them all out for a spot of fast running. His favourite game was hide the bouncy green ball in the sand and watch Mum and Dad search like lunatics to find it….. then repeat! Harris and Lewis are a history geek’s dream. There’s history at every turn. It was at Uig beach on Lewis that the famous Lewis Chessmen were discovered in 1831. 93 exquisitely carved chess pieces made from Walrus ivory and whales teeth. They date to 1150-1200 AD and are thought to originate from Norway. Eleven of the pieces are housed at the National Museum of Scotland in Edinburgh, while the rest are on display at the British Museum in London. Another historical highlight for me was Dun Carloway Broch on Lewis. It’s remarkably well-preserved given that it’s around 2,000 years old. Sadly, it was partially covered by scaffolding when we visited so we couldn’t explore inside. Near Dun Carloway Broch on Lewis is the Gearrannan Blackhouse Village. It’s a village of restored traditional Blackhouses which doubles as a museum and self-catering accommodation. We watched a weaver there make Harris Tweed on a traditional loom – it was fascinating and hypnotic to watch. The Calanais or Callanish stones on Lewis were the other bucket list site that attracted me to these beautiful islands. If you’ve been following this blog you’ll know that I have a thing for ancient standing stones – as in a BIG thing. Some might say I’m a wee bit obsessed. Calanais had long been at the top of my bucket list of stones to see and like Luskentyre Beach when I finally did get to see them they were far better than I had even imagined they would be. The stones were huge and I hadn’t appreciated that there were quite so many of them. It’s a truly magical place, shrouded in mystery. We’ll never really know the true purpose of the stones, but they have 5,000 years’ worth of stories they could share with us if only they could speak. The ruined Bunavoneader Whaling Station on the Isle of Harris was an unusual but fascinating site. It gave me the heebie jeebies, but in the sort of way where you can’t stop staring. The huge brick chimney looked completely at odds with the rugged scenery surrounding it. It’s the only remaining example of an early 20th century shore based whaling station in the UK and was designated as an ancient scheduled monument by Historic Scotland in 1992. No history geek tour of Harris and Lewis would be complete without a visit to the medieval St Clement’s Church at Rodel on Harris. The Historic Scotland scaffolding squad had kindly clad the church in scaffolding too so attempting to photograph the outside was a lost cause. Scaffolding clad historic monuments are the bane of my life. The year before my Outer Hebridean travels I took a day trip to Rome from Sorrento to find the Coliseum, Trevi Fountain AND Spanish steps enveloped in the dreaded steel piping. I’m a sucker for medieval knight grave slabs and inside St Clement’s Church are some stunning examples, so despite the scaffolding I was in seventh heaven. I stood transfixed in front of them for an age and even after I finally tore myself away I had to go back for one last look. This isn’t history related but it totally appealed to my sense of humour. There’s a tiny wee public loo at Rodel just outside the church. I can safely say it’s the only loo I’ve ever visited where I’ve found a guest book for signing. It was fun seeing the host of other nationalities who’d also stopped at this tiny Outer Hebridean loo to spend a penny. I just hope they all washed their hands before they signed! During our stay we also visited the pretty little island of Scalpay which is a small island 300 metres off the coast of Harris. Until 1997 when the Scalpay Bridge was opened the island was reached via a ferry service from Harris. It’s well worth a visit if you’re ever in the area. We loved the bridge. It must have made life for these islanders living off an island so much easier. Our accommodation was far too conveniently located for a visit to the Harris Tweed shop in Tarbert. I’m obsessed with Harris Tweed, so we left Harris lighter decked out like landed gentry and lighter in the pocket! The wee dug’s a fan too and looks like he’s just stepped right out of a shop brochure. Collars, leads, bow ties, neckerchiefs and a rather nice winter jacket are just some of his tweedy wardrobe staples. Harris and Lewis are dotted with abandoned crofts and Shielings which I fell in love with. A colleague who grew up on Harris told me it’s to do with strict crofting regulations which mean the property and land must be used for crofting. Many have been passed on to a younger generation who no longer live on the islands or want to croft so they simply lie empty and fall into disrepair. I’d love to have spent more time photographing them but it’s a good excuse for me to return. I’ve only scraped the surface when it comes to sharing what I loved about these wonderful Islands. This was one of my all time favourite Scottish trips and I can’t wait to return. I hope this has given you a taste of the beauty that’s to be found on Harris and Lewis. Maybe it’s even convinced you to pay them a visit too? Next Glen Lyon – home of the Fortingall Yew. Brillant photo and history, weather looked good too. Will defo add to my bucket list. Thanks for sharing. You’re welcome. It’s a spectacular place and we were very lucky with the weather on that trip. I really enjoyed reading your post, it brought back some memories! My wife and I took our kids on holiday to Lewis last summer and we had an amazing time, I’ve completely fallen in love with the islands! We drove down to Luskentyre for the day during our trip and it was incredible, just miles of beach with the mountains in the background. I’d also really, really recommend Traigh Mhor on the road north out of Stornoway – the beach there seems to go on forever! Hi Ed, thanks for stopping by. I’m so glad you enjoyed reading. It’s impossible not to fall in love with these special islands. I bet your kids loved the amazing beaches. There’s nothing quiet like the colours of the Outer Hebrides for me. Thank you – they’re stunning. One of the most beautiful places I’ve ever been. Hi, Sam it’s me Nicoletta, I follow your blog via email from some time now. This post is so far my favourite but I haven’t red them all jet. I just wanted to congratulate with you for your blog it’s wonderful as it is your ig account. Ciao Sam. Nikkib. What a great read, not that it’s a surprise! Julie and I had our first holiday together in August 2004 – we stayed in a cottage in Leverburgh and we’re both blown away by the beach at Luskentyre. We’ve been meaning to go back ever since, even more so since reading this!